Since cracking the chocolate recipe, I've been unusually quiet. Although I am very grateful for her work, I feel a bit like a charlatan for using her photographs to get on Foodgawker and Tastepotting. She did things with my cupcakes that I can't even pretend to comprehend. I mean, look at that photo above! I can't believe that's my apartment -- it makes it look like I live in a spacious, sunny apartment with gratuitous windowsill space and impractical Anthropologie furnishings. Which, last time I checked, I didn't. 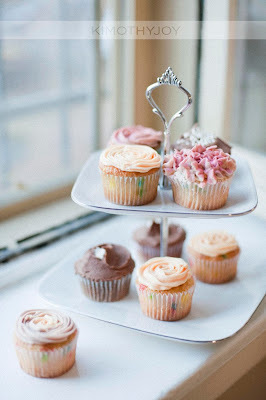 I haven't even discussed the centerpiece of the shot; my boxed-mix Funfetti cupcakes had suddenly morphed into boutique, designer cakes with delicate pastel frostings. I knew my blog was lacking in the photo department (considering my paltry Instagram photos and my iPhone shots) but seeing her photos made me realize just how much I sucked. In fact, I was too embarrassed to even log on to Foodgawker the next day -- I was nothing compared to all these bloggers featured on the site. Not only did these bloggers concoct tasty, original recipes, they also took beautiful photographs, designed their own websites, and wrote entertaining stories to accompany their recipes to boot. Seriously. Do these people not have jobs or something? Where do they find the time for all this?! Because I've been trying all week, and I'm spent. Why the weird orange tint on my cupcakes? The orange tint filtered out the actual colors of my cupcakes -- pale oranges and ivory whites now appeared to be neon orange! Grunt. No orange tint. Perhaps it had something to do with the fact that I'd taken the previous photo at night time, while her above photo was taken during the day, when my apartment received the most natural light? The problem with shooting exclusively in natural light is, unlike these other Foodgawker bloggers who don't seem to have full-time jobs or secretly have Time-Turners or something, I'm anchored to a grim office for about 9 hours of the day. So that means that most of my baking is done at night -- and the night time doesn't really lend itself to good natural lighting in my apartment, as evidenced by the orange tint in my photograph above. But I've also been reading a book about food photography that I highly recommend to other sad blogger sacks who have just realized that a dSLR does not exactly guarantee good photos. It's called Plate to Pixel: Digital Food Photography & Styling -- it's run by a French woman who maintains an astoundingly beautiful blog where it look like she lives a ridiculously fabulous life. Not that I'm jealous or anything. She has a section on her book dedicated to something called the White Balance feature on dSLR cameras. Apparently, this setting removes unrealistic color casts by accounting for the color temperature of a light source; whilst our eyes are good at judging what white is under different light sources, cameras often have difficulty doing so. Adjusting the White Balance is necessary so that the colors in pictures are represented as close as possible to real life colors. It's hard to tell the difference between the two, but if you look closely, you'll see that the first image has harsher shadows and a slightly orange tint to it, despite the fact that the two photos were taken a few seconds apart from each other and in the exact same lighting situations. While I had left the White Balance on "Auto" for the first picture, I had adjusted the White Balance in the second feature to adjust for the natural light streaming through the window. The result was softer shadows and a more accurate exposure of the cake. Now what does this have to do with adapting the Hummingbird Bakery Cookbook for high-altitude? I know that my regular readers are probably disappointed that I haven't posted a new recipe or experiment since my success with the Hummingbird chocolate cupcakes recipe, and for that I apologize. When I first started this blog, I underestimated the amount of time and effort it takes to run a successful blog. I didn't realize that, not only did I need to have an astonishing amount of vigilance and patience to try the same recipe over and over again, I also needed superb photographs and an interesting web design to be as compelling as the bloggers I admired. And now that this blog has reached an audience wider than that of simply friends and family (thanks to Foodgawker and Tastespotting), I realize how woefully adequate I actually am to run such a blog. I lack the necessary skills -- specifically, photography, Photoshop, HTML, and CSS skills. So starting with this post, I've decided to document my journey as I try to understand what it takes to run a successful blog and accumulate the skills I listed above. In the meantime, I'd like to thank Kimothy once again for her beautiful photography until I figure it out for myself. Her wedding photography can be found here, while her food photography can be found here. I'd also like to thank my friend Troy for helping me redesign my blog. Before he came along, the blog really looked like it belonged back in 1999. Troy is one of the most talented designers I know; his work can be found here. He's responsible for the pretty layout you see today.